mz knits: well, whaddya know? okay. so after requesting help from the wise ones on the knitlist, this whole thing about how in the world to make thumb holes in mittens became crystal clear. when i got home this evening, i couldn't wait to jump right in. but i played a few games of tonk and spades with JWJ and his parents (and sipped on a jack daniels downhome punch) before getting cozy on the couch with my needles. i just did what the directions said and ended up with a lovely mitten hole! thanks to everyone who emailed me about how to do this, especially: starr, dolma, robin and catherine. 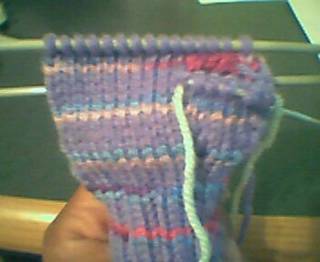 i like the striped pattern, but i'm going to use this mitten as "rough draft" LOL the rest of the mitten will be done with the plain purple yarn. i'm tired of changing colors every 2 or 3 rows! that would make for an awful lot of ends to weave in at the end! 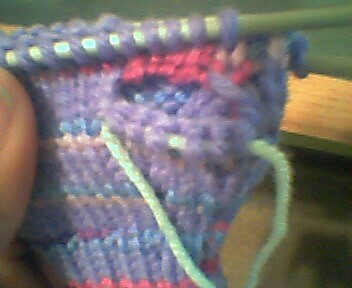 for the "real" mittens maybe i'll use the variegated or something to make it interesting. and speaking of stripes...does anyone have a better way of joining yarn? all i've been doing is tying on the new yarn to the old and knitting away. i don't like that method very much but i don't know any alternatives. holla if you can help!